Hey everyone, guess what??!! 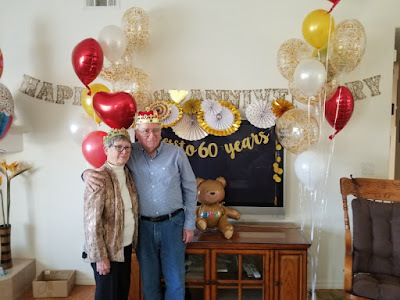 Today is my parents' 60th wedding anniversary! That's right, sixty! Six decades! Sorry for the numerous exclamation points, but I think it's wonderful. In tribute, I dedicated last weekend's WND column to them. Once upon a time in 1931, a baby girl named Lucille was born into what would eventually become a huge family of 13 children. This wasn’t a happy close-knit family, though. The children were terrorized by a brutal alcoholic father and a blind mother perpetually cowed by his rampages. He habitually beat the holy tar out of his children, leaving one or two of Lucille’s brothers with mild brain damage as a result. The family frequently starved. Isolated in the bayous of Louisiana, her father was a fisherman who often drank what little income he had. 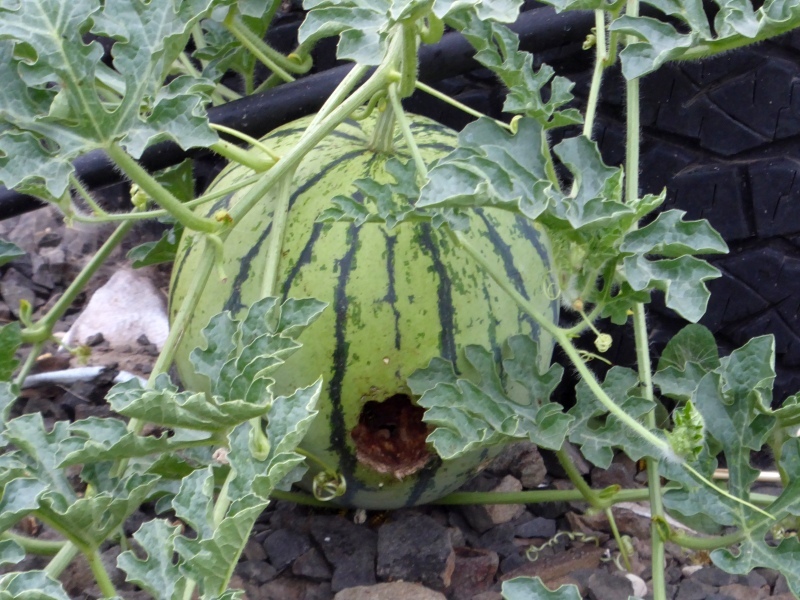 With so many children, the family seldom had enough to eat. Lucille was so thin that even in her mid-20s she weighed a mere 87 pounds. Knowing she had to get out of there, Lucille knew her best option was education. Just about the only job opportunities open to women back then were teaching or nursing. She became a nurse. She grew into a woman of uncommonly fine common sense. Much of her education outside of nursing was self-taught. She learned to sing. She grew to love classical music. Most important, she made herself a promise never to treat her future children as she herself was treated during her childhood. She knew what a mistake it would be to marry someone like her own brutal father. Instead, she concentrated on excelling in her chosen profession. At age 26, she met a nerdy man named Michael when they both sang in a church choir. Lucille recognized that, nerdiness aside, here was a man who would be an excellent father and husband. She was right. Michael turned out to be a man with a brilliant mind and a kind disposition. 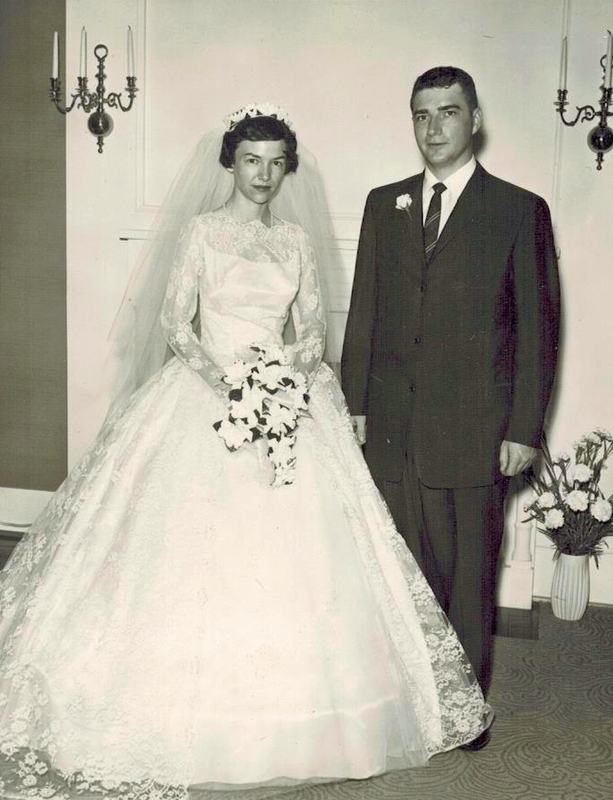 Sixty years ago this very day – on August 30, 1958 – this couple stood in church and made vows to each other before God and family. I’ve seen the black-and-white photos. There stood a skinny woman in an all-lace dress, facing a man four years her junior in front of a priest. Probably both of them were nervous. Almost exactly four years later, following the birth of their first son, I was born. My mother suffered through multiple miscarriages and staggeringly difficult pregnancies, so complicated that after three live births my parents gave up having more biological children and adopted my youngest brother to complete their family. My father survived a cancer scare and then a grave heart attack that nearly killed him. They faced serious financial hardship when my father left his corporate job and started his own business about the time the 1970s recession and oil crises hit. But they persisted, working together to overcome the obstacles fate threw in their path. My father’s cool head for business and sound ethics meant his company gradually grew, despite the economic slowdown. My mother could have gone back to work as a nurse, but she knew the importance of staying home with her children. My parents always put family over profit. While their wallets were often thin, their hearts were full. They tempered their challenges with humor, love and marital devotion. They gave their children the blessings of a stable home, something I took for granted until I reached adulthood and recognized it for the gift it is. They cheered us on our childhood activities and kissed the booboos when we failed. They sacrificed financially to send us to college. They were always there for us. I could always count on that, and still do. Their example is the foundation for my own happy, stable marriage. Without the illustration of what true commitment was like, I doubt I would have been as fortunate in my choice of husband. Now the gift is being handed down to my children, their grandchildren. And so the legacy continues. This is not a big story of earth-shattering importance. This is a small story about two people in a world of billions. But these two people – along with the millions of other small stories out there – are the real hope for a better world. Small stories add up, and that’s why I’m writing this. Long-term stable marriages are increasingly rare in this country as the culture of divorce takes over. My mom will be 87 in a few days, and my dad just turned 83. The gratitude I feel toward my parents for the example of six decades of marital unity can’t be underscored enough. According to the National Center for Family and Marriage Research at Bowling Green State University, only seven percent of marriages make the 50-year mark. How many make 60 years? I don’t know, but I suspect these “Diamond anniversaries” are as rare as, well, diamonds. What’s the secret for 60 year of happiness? It starts with love, of course, but it’s more than that. My parents knew they were compatible in critical areas such as faith, finances and family, and that helped immeasurably toward marital harmony. Just as important is respect. My folks have never torn each other down; they’ve only built each other up. Even in hard times, they knew divorce was not an option, so they buckled down to make things work. “Already have it,” Dad said with a smile, and dropped the fortune on the table. I saved that fortune. Why? Because it SO encapsulates the love my parents have for each other and for their kids and grandkids. Happy Diamond Anniversary, Mom and Dad. I love you. Meet Lisa Steele of Fresh Eggs Daily! A couple weeks ago, I had the privilege of interviewing Lisa Steele of Fresh Eggs Daily. This was for a blog post with Lehman's. Lisa turned out to be just the nicest person imaginable. Go read the blog post -- and if you're anywhere near the Kidron, Ohio store, it would be worth visiting her in person! 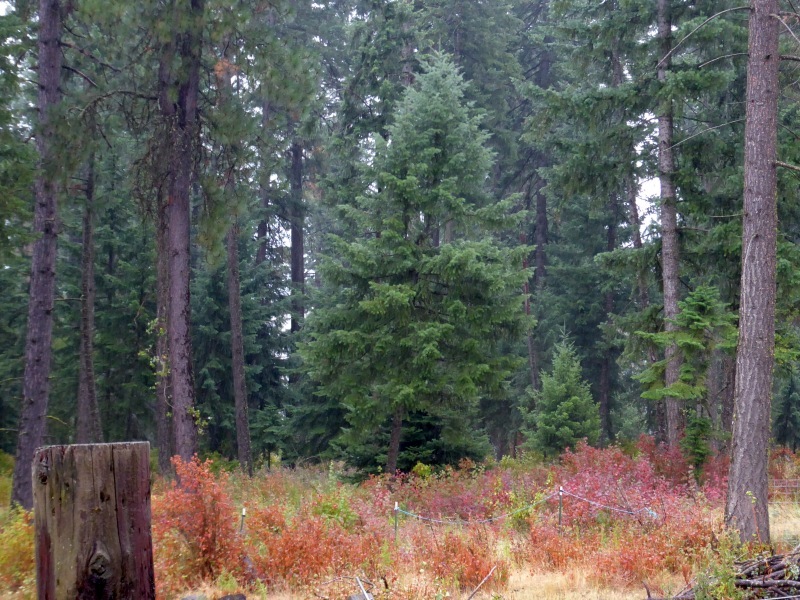 We have been bone-dry here in North Idaho for about eight weeks. Normally we get some rain during the summer, but not this time. Everyone's been walking on a knife-edge regarding fires, which thankfully have spared us this summer. 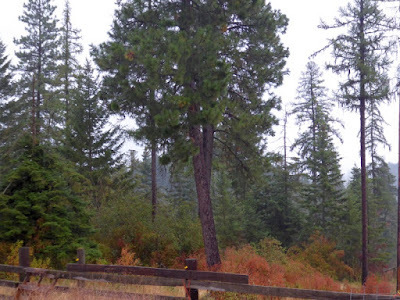 But yesterday afternoon, a light but steady rain moved in and blessed us with moisture. 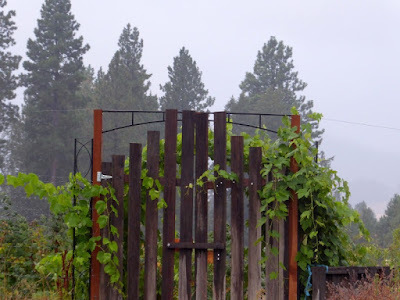 It rained all night -- it was delightful to snuggle in bed and listen to the pattering on the roof -- and it's still raining as I write this. For a few more hours, at least. 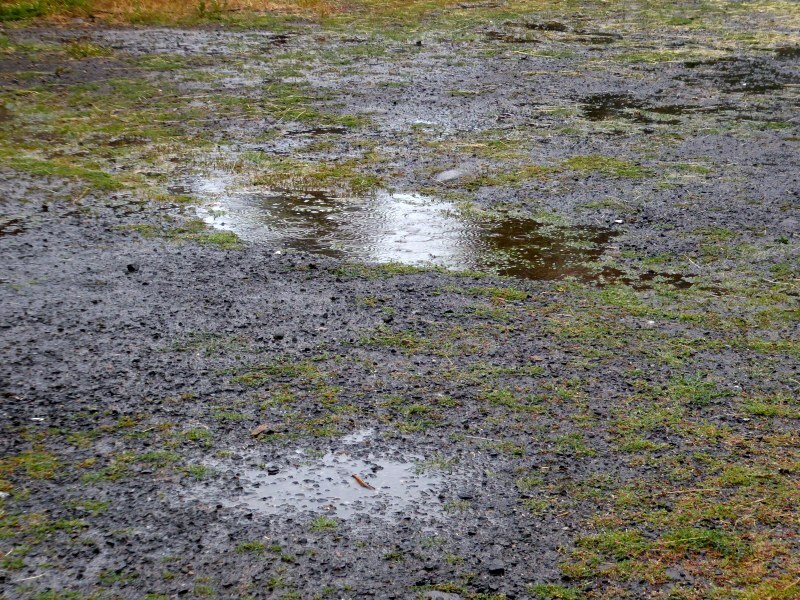 By this morning there had been enough rain to form puddles. The thirsty land is absorbing the water with relief. The vegetation looked newly washed and very happy. It looks like I'm off garden-watering duty for a couple days. No argument! As many of you know, I love to poke fun at the spam comments I get on this blog. 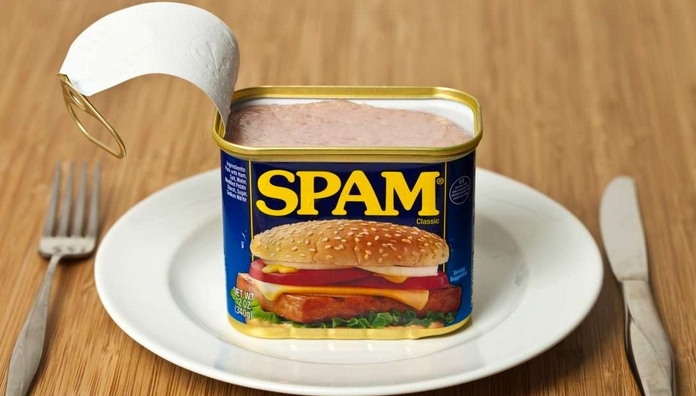 I've mocked the use of the term "fastidious" (WHY is that term so popular among spammers? ), so-called Apple support, offers for "magics," tearful pleas from international vacationers, and other garbled messages. • I was examining some of your content on this internet site and I conceive this web site is rattling instructive! Retain posting. • Sweet internet site, super design, rattling clean and utilise pleasant. • Hi to every body, it's my first visit of this web site; this webpage carries awesome and genuinely fine material in support of visitors. 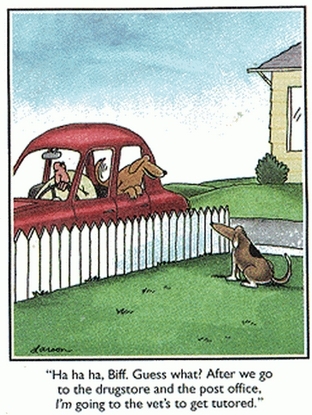 • I do consider all the ideas you've introduced to your post. They are very convincing and can definitely work. Nonetheless, the posts are too quick for newbies. May just you please prolong them a bit from subsequent time? Thanks for the post. • Hi there colleagues, its fantastic paragraph on the topic of educationand entirely explained, keep it up all the time. • Ahaa, its nice conversation concerning this piece of writing at this place at this weblog, I have read all that, so now me also commenting at this place. • Hi friends, how is all, and what you desire to say regarding this paragraph, in my view its really awesome in favor of me. • Good way of explaining, and pleasant post to take data on the topic of my presentation subject matter, which i am going to deliver in university. 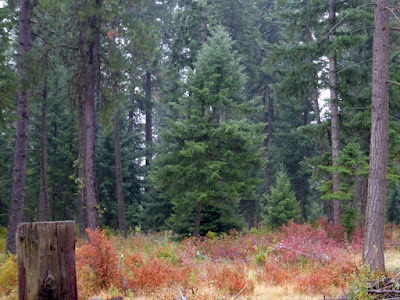 • Hi, after rｅading this amazzіng post i am also cheerful to share my knowledge here with mɑtes. • Hello Dear, are you genuinely visiting this web page on a regular basis, if so then you will definitely take fastidious knowledge. • That is very type of you to say. Yes, it does. • It's amazing to pay a visit this web site and reading the views of all mates on the topic of this paragraph, while I am also keen of getting familiarity. • Fastidious answers in return of this issue with real arguments and telling the whole thing concerning that. • whoah this weblog iss wonderful i like reading your articles. Stay up the great work! You understand, many people are hunting around for this information, you could aid them greatly. • This article is actually a fastidious one it helps neew the web people, who are wishing in favor of blogging. Can't argue with that! "Stay up the great work," guys. Guess what Mr. Darcy did today? That's right, he got "tutored"! I took him to the vet this morning for a de-nutting procedure. Now he's home recuperating, doubtless wondering what hit him. The worst thing of all? 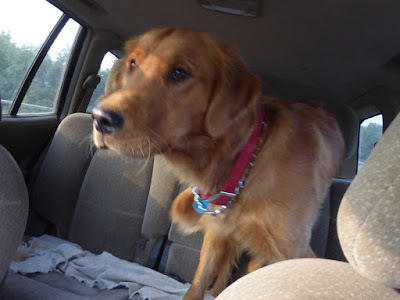 He has to go a whole week -- seven days -- without running! How will he ever survive? 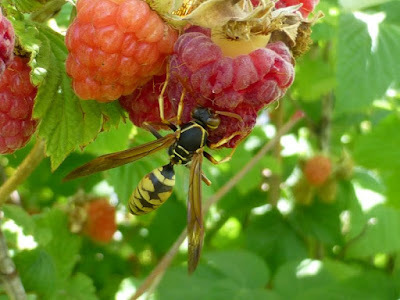 A few days ago I put up a post about the horrifically bad wasp year we're having. Outdoor activities had to be suspended except before dawn or after dark because of how many stinging insects were swarming the area. We're not alone -- everyone we know is experiencing similar issues. 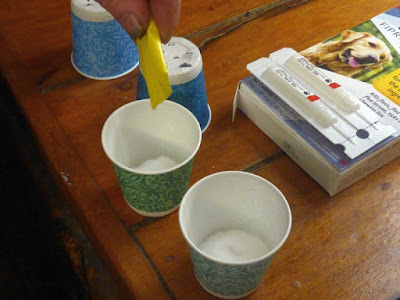 Recently Don was in a hardware store, and he noticed they had shelves and shelves of wasp traps for people desperate to control them. Wasps in this volume aren't just annoying, they're dangerous -- particularly for people who have reactions to stings. Everyone felt they were being held hostage indoors. Nearly every day, we would set a trap and it would fill almost to the brim. Every. Single. Day. 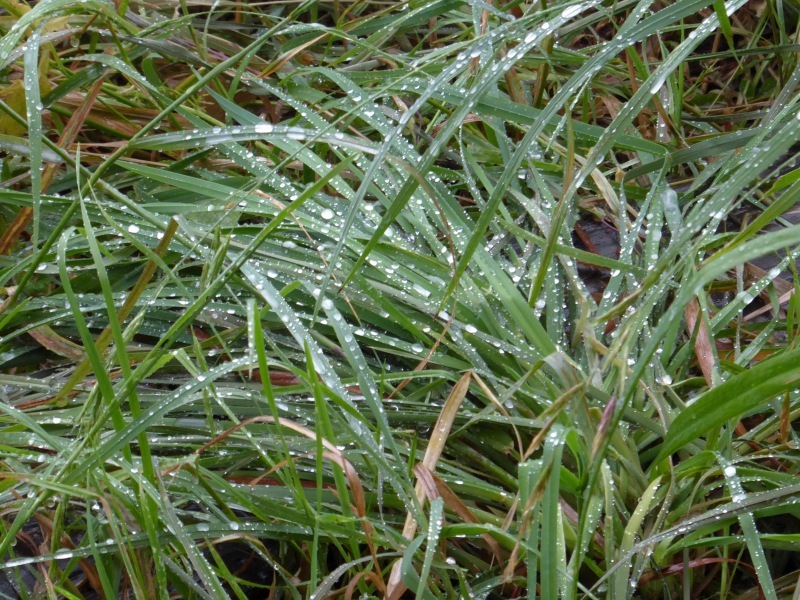 Fipronil is a broad-spectrum insecticide that disrupts the insect’s central nervous system. Fipronil is the main ingredient in Frontline and other flea and tick killer used on dogs. Recall that Frontline is placed on the dogs back at the withers and keeps the dog free of these pests. It is not harmful to pets or humans in the dosage of casual contact. 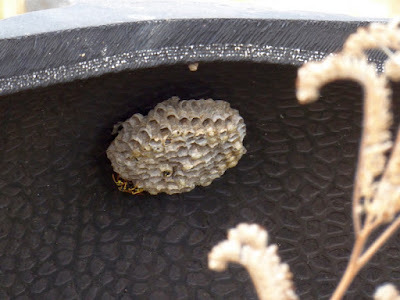 It will kill other yellow jackets that come into contact with it as it dies in the nest. 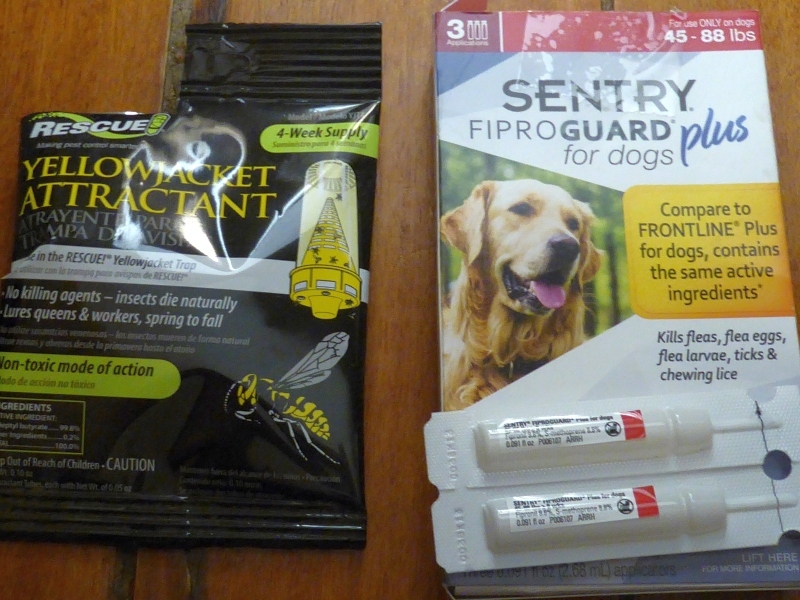 Several of the flea and tick killers available at your pet store or at Big R (Petco, etc.) contain Fipronil. But be careful to get the product that contains only Fipronil as its active ingredient. 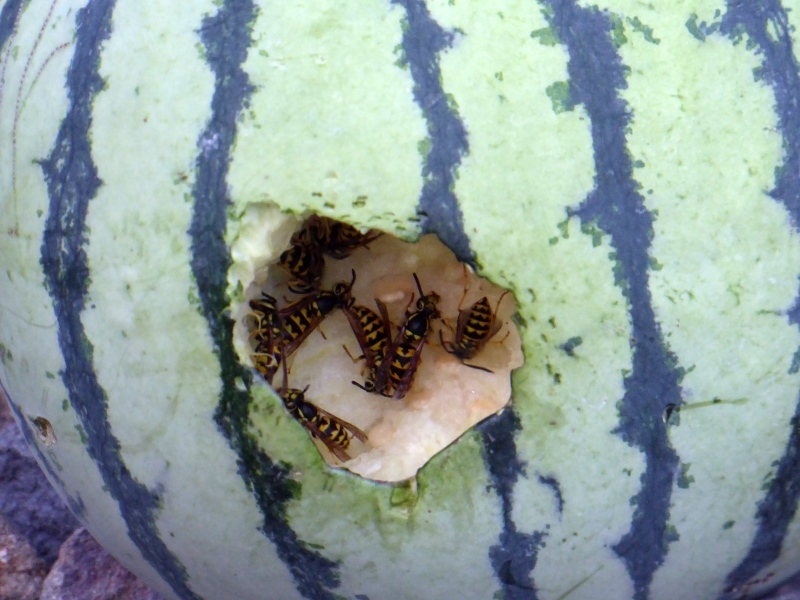 When Fipronil is coupled with other ingredients, the wasps will ignore it. 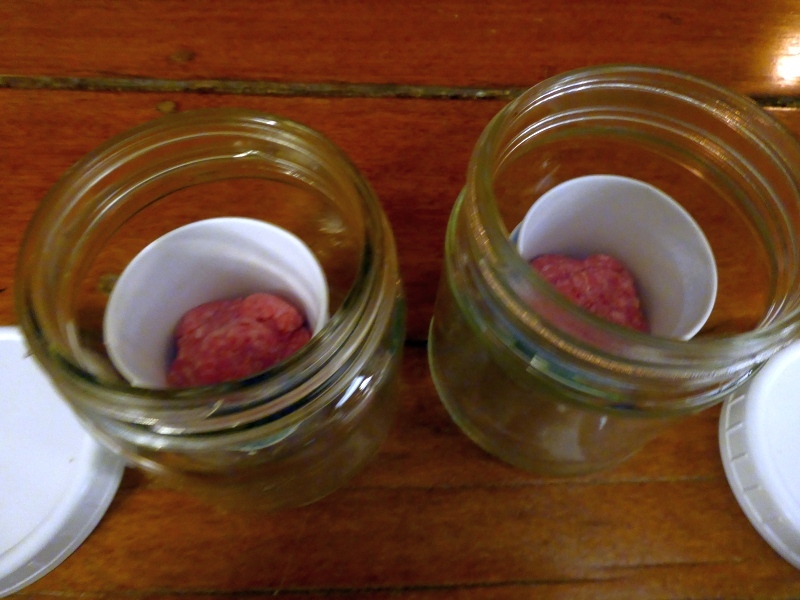 Mix 6 to 10 drops into a golf ball sized gob of raw hamburger (if you macerate it in a blender it works better). 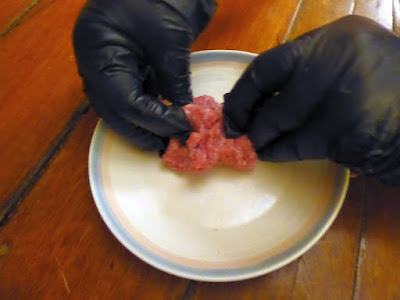 Place this gob of poisoned meat into a small plastic cup. 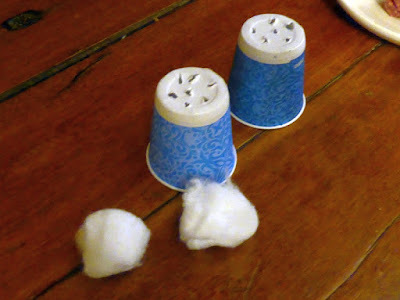 Add 1/2 of a cotton ball on which you squirt half the contents of a tube of RESCUE Yellowjacket Attractant found at most hardware stores. 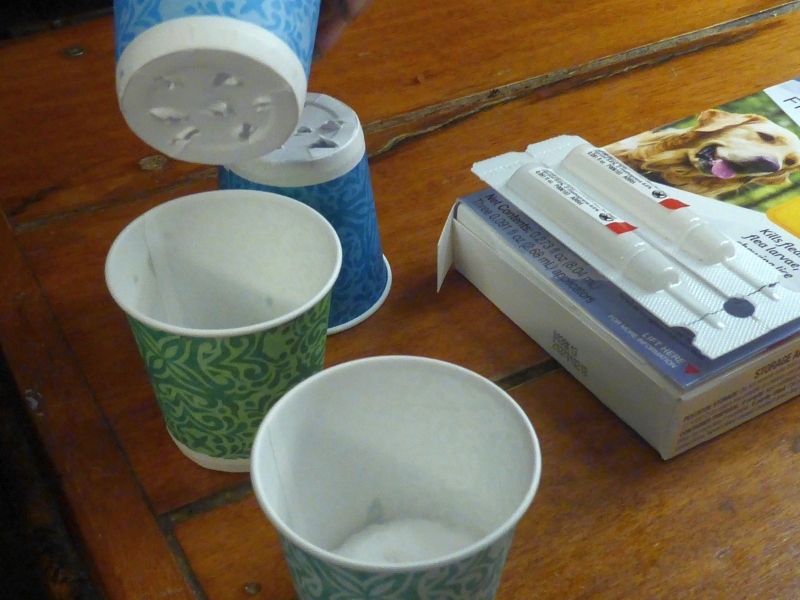 Place the poison bait cup in the shade 2 to 4 feet off the ground and 10 to 15 yards away from doors, patios, grills – people trafficked areas. 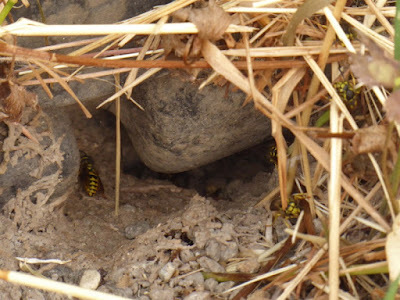 80% of the Yellowjacket nests within 100 yards will be dead within 24 hours. 95% will be gone in 48 hours. 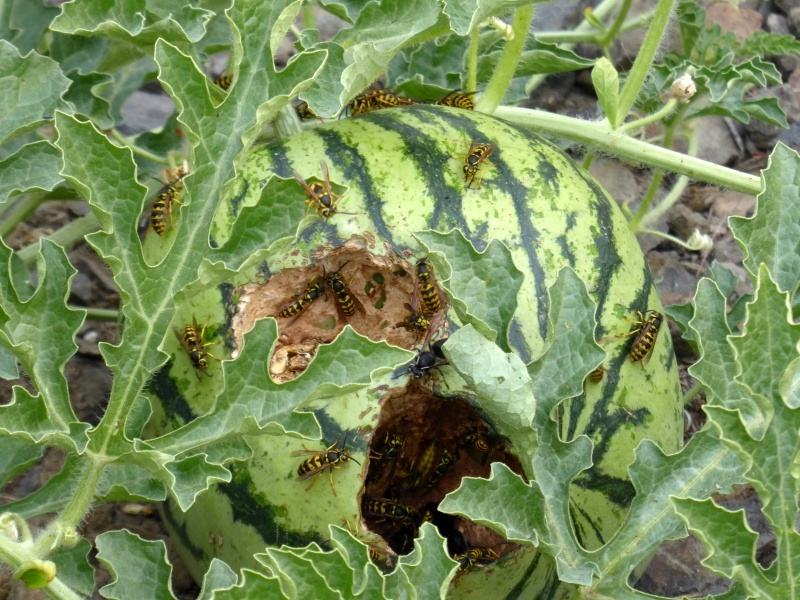 Renew the bait every day (Yellowjackets don’t like dried or rotting meat). 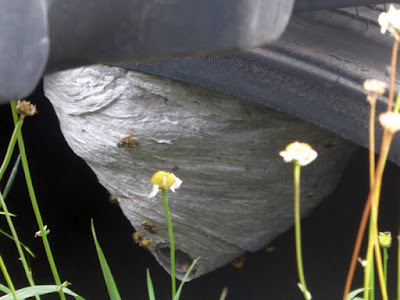 After 4 days 100% of the Yellowjacket nests within 400 sq. yds. will be dead. Repeat baiting after 4 weeks for a few days. It should end your problem. 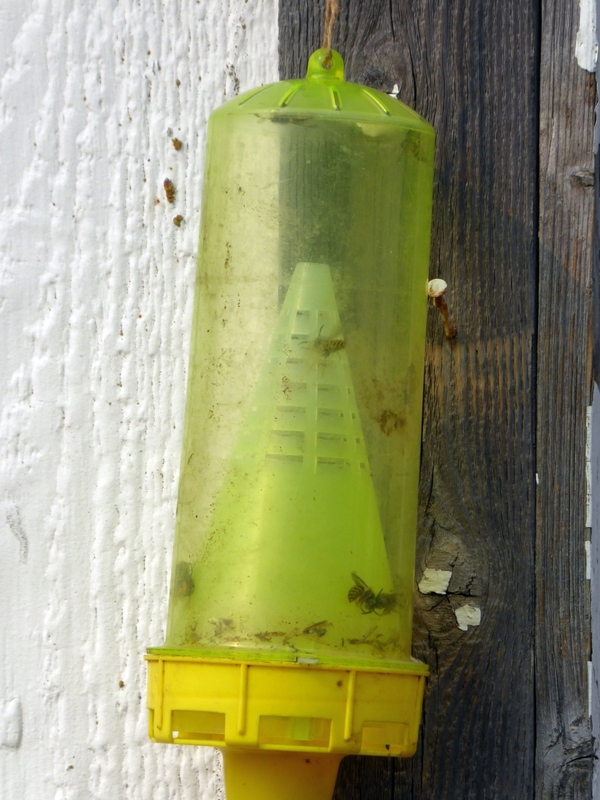 As a monitor on the success of the project this person kept one of the Rescue Yellowjacket Traps in the yard and dumped it every night to check on the quantity of wasps in the area each day. 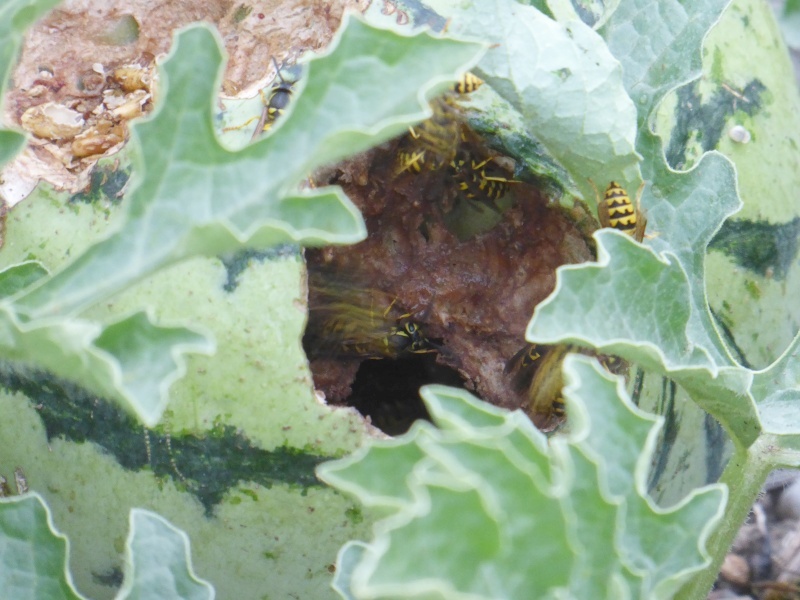 The count dropped from several hundred/day to 2-4 wasps/day in 2 days and in the forth day, there were none. 1. Use only Fipronil – no other active ingredient. It’s found in flea and tick killers. 2. 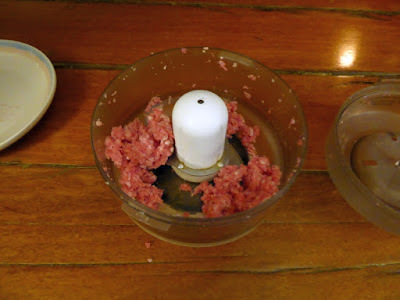 Mix 0.1% with hamburger. 6 to 10 drops per golf ball sized gob. Macerated burger is better. 5. Continue use for 4 days. 6. Repeat after a month for a few days. ...and four small paper cups. 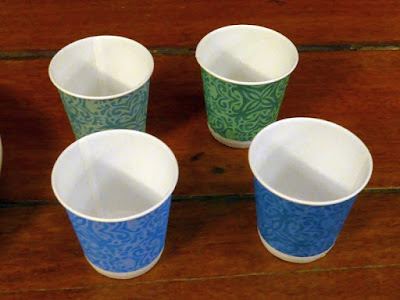 In two of the cups, we punched holes in the bottoms. Then we got two cotton balls. 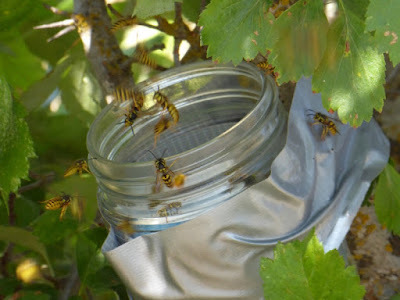 We already had on hand Rescue wasp attractant and Frontline Plus tick repellent. ...and added wasp attractant to the cotton. Then we loosely fitted the paper cups with the perforated bottoms over the other cups. 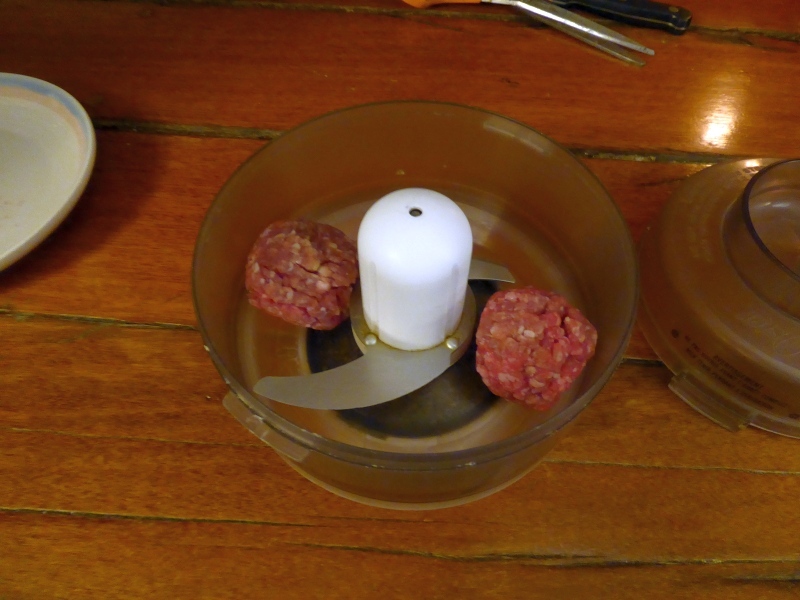 Next we took the ground beef and mashed it up a bit more in a food chopper. 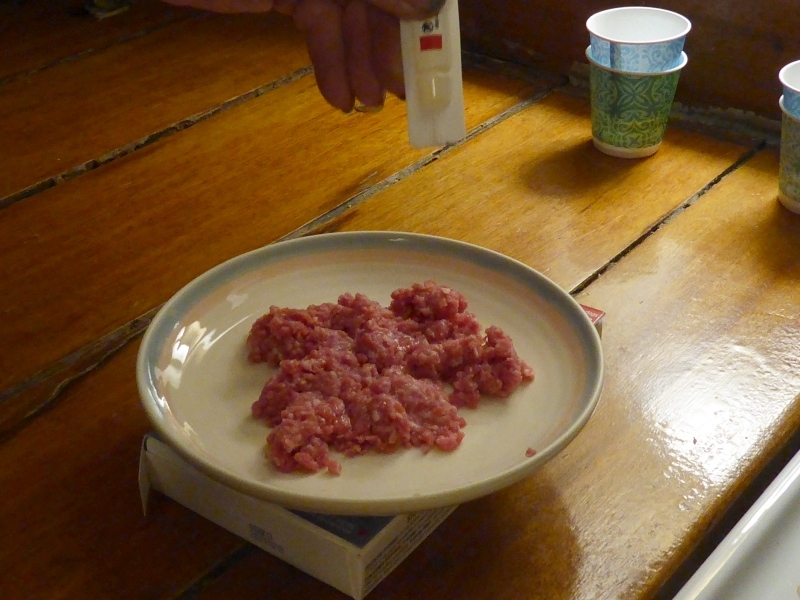 To this meat, Don added 16 drops of the fipronil tick repellent. 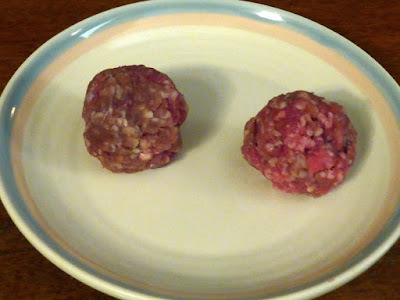 Each meatball needs about eight drops of poison (I gather too much isn't good) and since we had two meatball's worth of ground beef, he added 16 drops. Then I donned latex gloves (just in case) and mashed the meat and poison over and over and over. Then we re-formed the meat into two meatballs and put them in the upper cups (the ones with the perforated bottoms). We put these in jars, capped them, and put them in the fridge overnight. 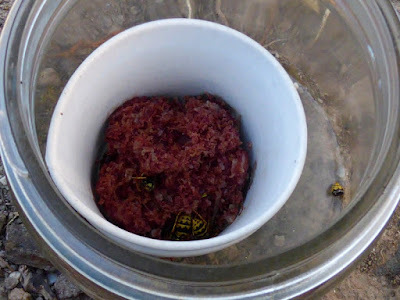 You never want to put wasp attractant out during daylight hours -- the stuff works instantly -- so we stuck it in the fridge overnight so the meat wouldn't go bad. 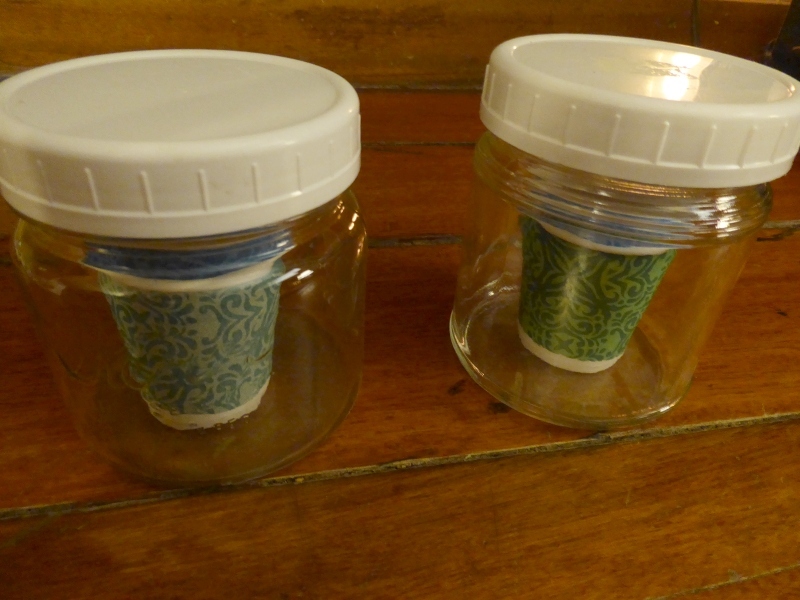 Early the next morning (well before sunrise), I removed the lids and put the jars in two locations, where doggies couldn't go. Both locations were in the shade so the meat wouldn't dry out too fast. 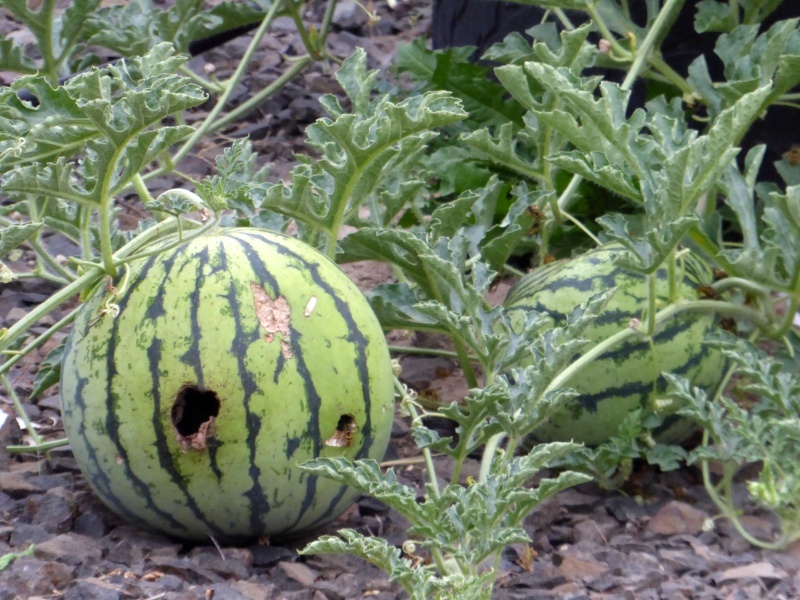 One I put in the orchard, and the other I duct-taped to a small tree trunk along our driveway. In neither location were congregating wasps likely to bother anyone. At first nothing happened. 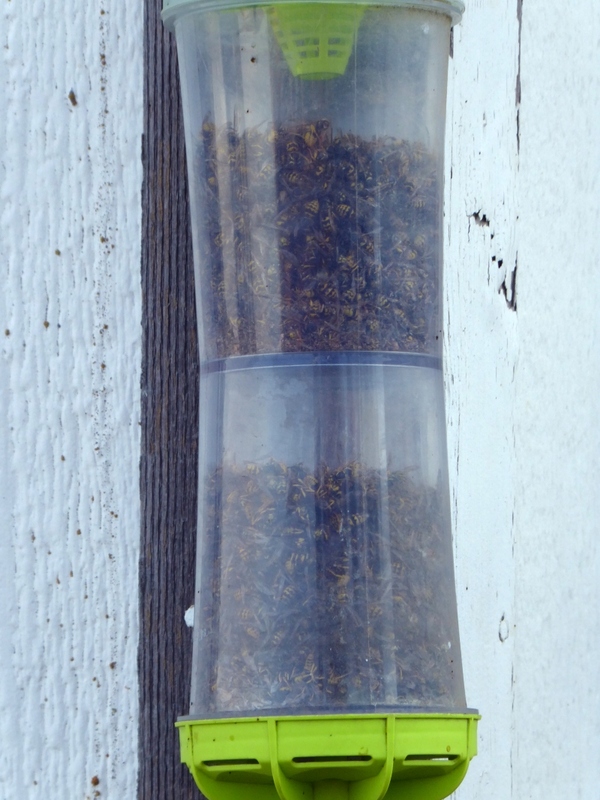 I think the chilled wasp attractant wasn't doing its job until it had a chance to unchill. 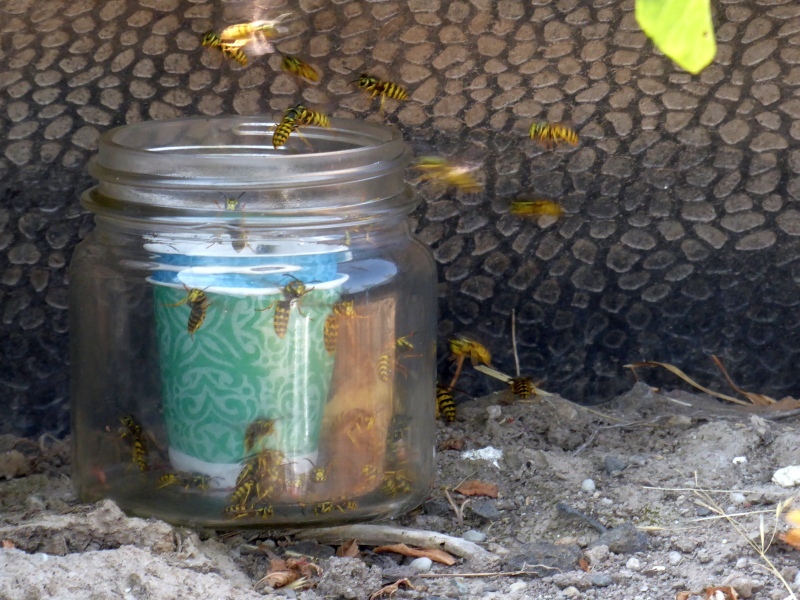 But within a couple of hours -- my goodness -- the bait was swarming with wasps. All day long the wasps carried snippets of poisoned meat back to their nests. By the next morning, the volume of meat was reduced by more than half, and there were some dead wasps in the jar. I checked on some nearby nests and noticed the insects looked very lethargic. They weren't moving much, and certainly weren't flying around. As the day progressed, the lack of wasps was extremely noticeable. 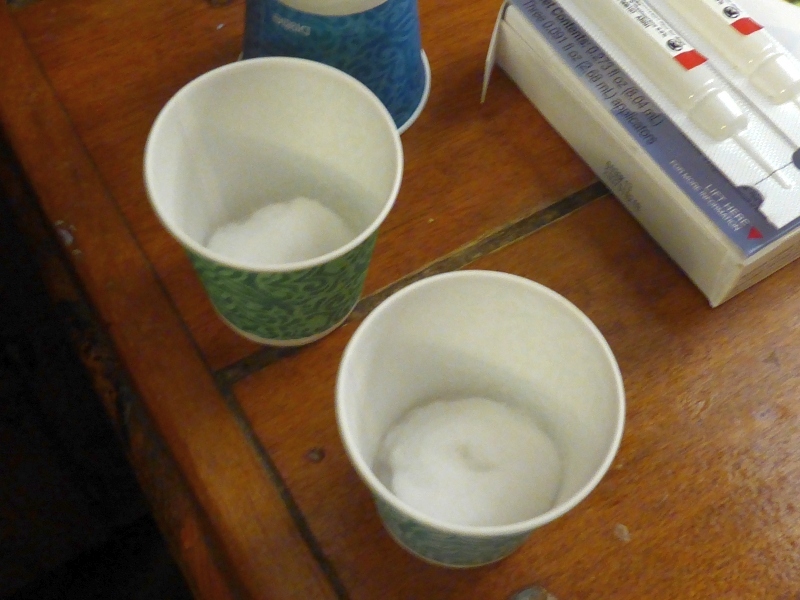 There were a few, yes; but we estimate the quantity was down by 95 percent or more. 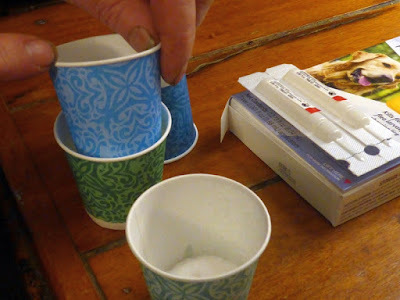 To test this, Don baited a trap in the morning and set it out. 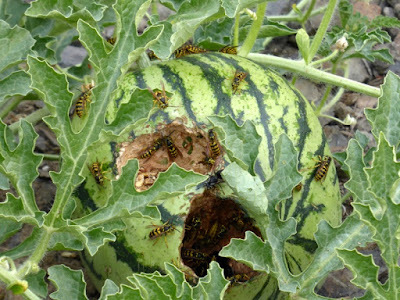 by afternoon, it had caught maybe five wasps. Remember, previously this trip would be full to the brim. The difference outside is staggering. We can walk around without a problem. The tension is gone -- I didn't realize how tense we were until the threat was removed. 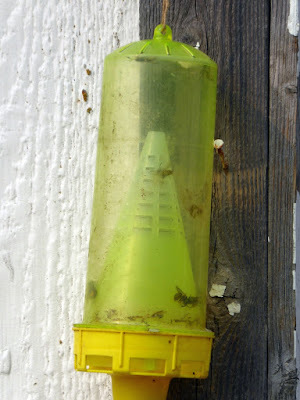 We still have some wasps, so we're going to repeat this procedure a second time, and possibly a third if needed. This works, folks! 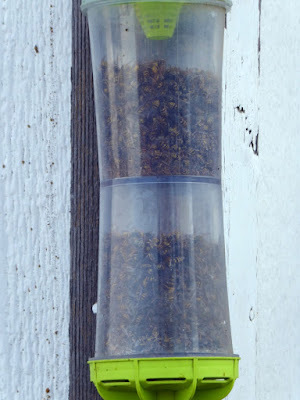 If you're plagued by wasps, I urge you to try this to control them. And the nicest part of all? It doesn't bother honeybees, which don't eat meat and aren't attracted to wasp attractant. We have a neighbor who keeps both horses and cattle, and at this time of year he's always on the lookout for Good Deals in hay. 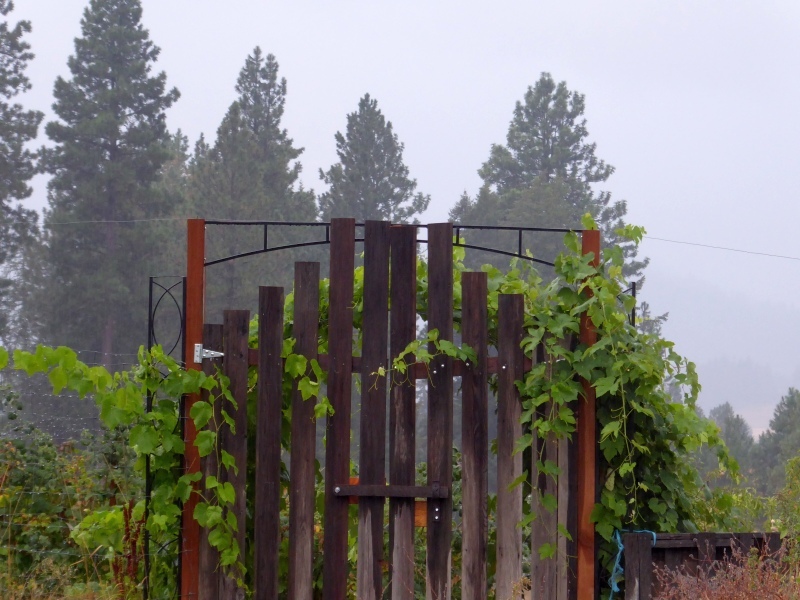 He's one of those people who simply knows everyone, and so Good Deals are likely to come down through the grapevine to him before almost anyone else. Such was the case this year when he scored round bales of bluegrass for $55/ton, an incredible price. We just sold off two six-month-old calves, so we're down the seven animals we'll be over-wintering. 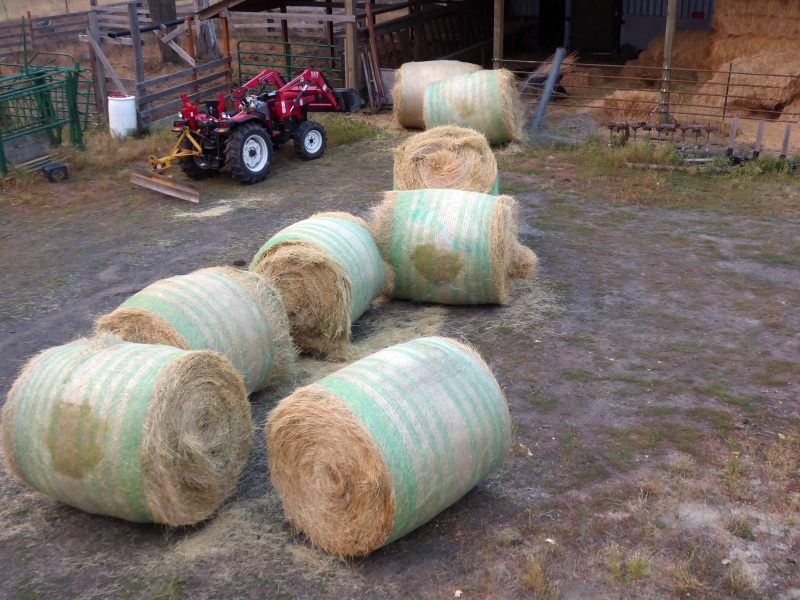 In years past we've had as many as 23 animals (way too many for our acreage) and needed a proportionately high amount of hay, but this year we won't need nearly as much. 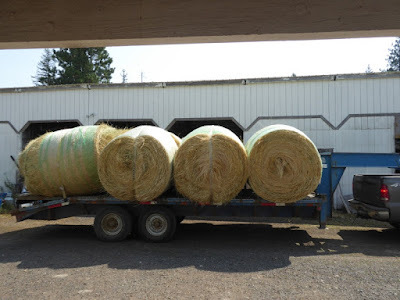 In fact we have several tons of leftover hay in the barn -- it will be fine for another year of feeding -- and just wanted to supplement our supply with another three tons or so. Our neighbor, who was engaged in hauling hay for his own animals, agreed to haul three extra tons for us as well. He pulled in yesterday with his gooseneck trailer loaded up. This fellow is a former long-haul trucker and we have never, but never, seen anyone more talented in backing trailers and maneuvering huge rigs in tight spaces. 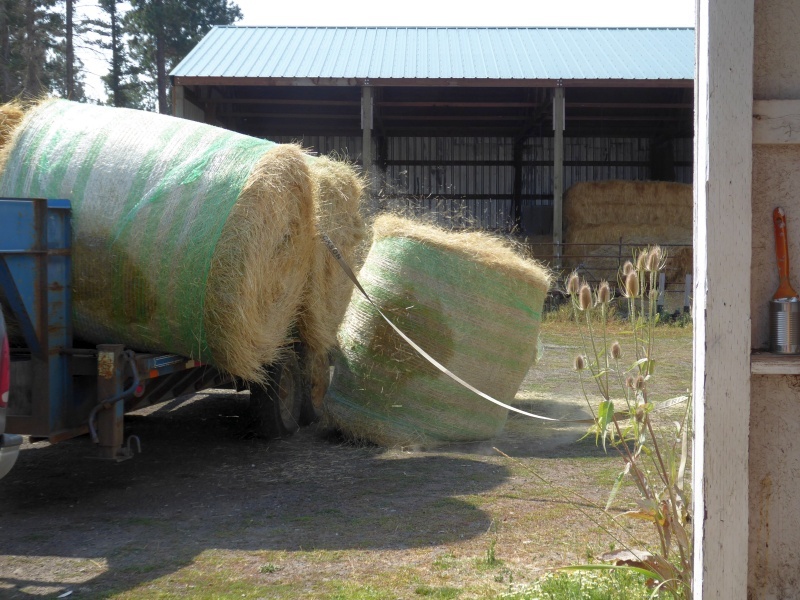 These bales are comparatively lightweight at about 800 lbs. each. Don shoved most of them off the flatbed with the tractor. 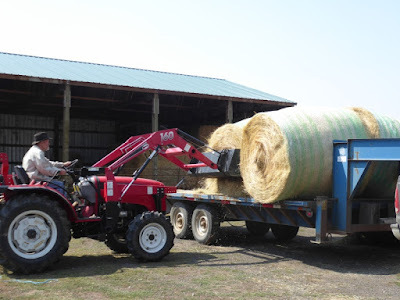 The last few bales were too far over for Don to reach with the tractor bucket, so the three of us -- Don, myself, and our neighbor -- climbed onto the flatbed where we heaved-to and rolled the remaining bales onto the ground. We have some cleanup work to do in the barn before we can put these round bales under cover, but rain is not expected anytime soon so they'll do just fine waiting outside until then. 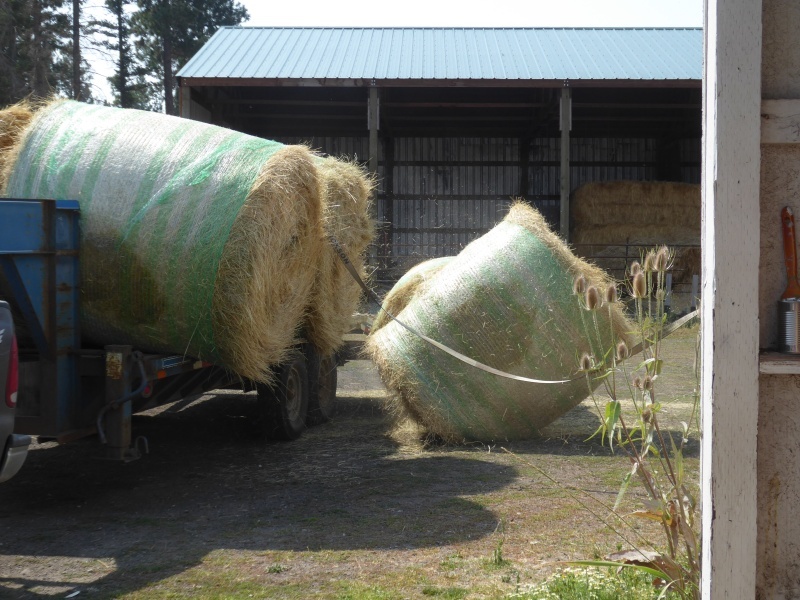 And meanwhile, it's an awfully nice feeling to have our winter feed taken care of, thanks to our neighbor's help. 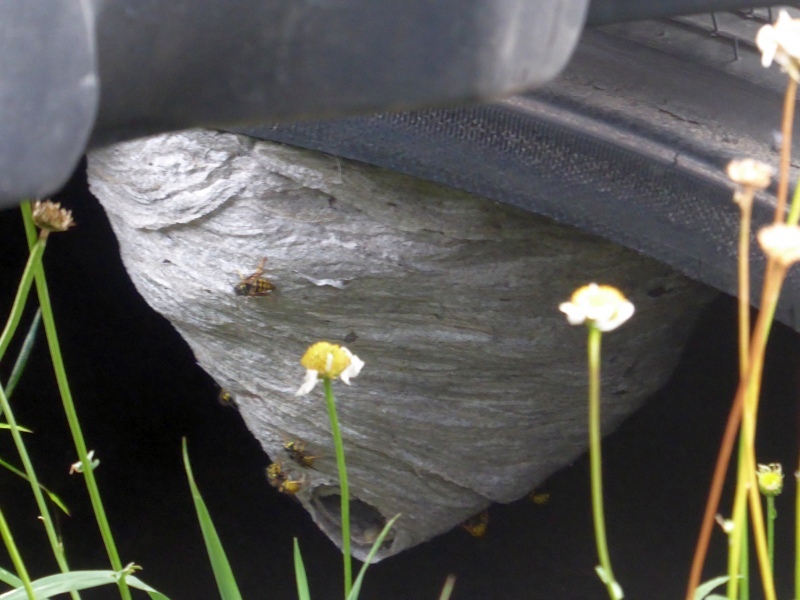 We are having a very very VERY bad summer of wasps and hornets. Wasps are stinkin' everywhere. It's impossible to step foot outdoors without having these nasty hymenoptera hovering around, making outdoor work impossible. 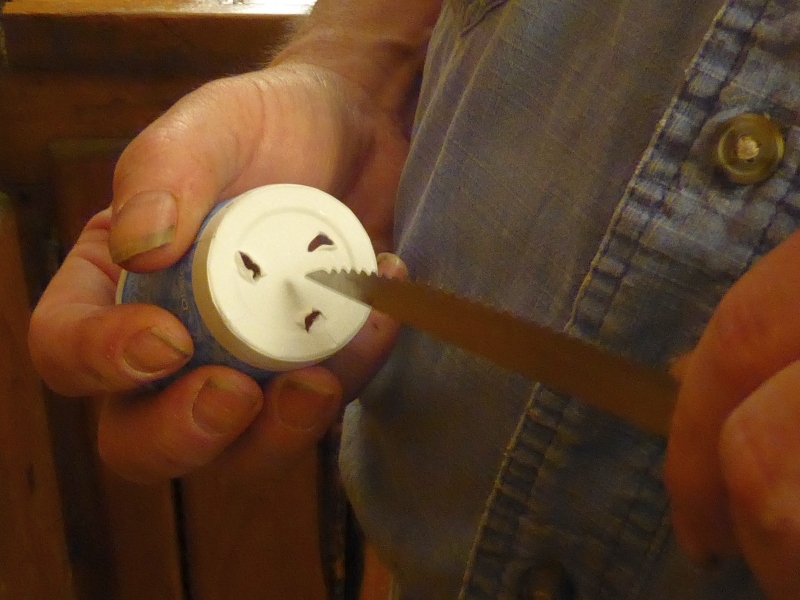 Don tried to do a wiring job on a small trailer the other day and got driven indoors within minutes. I've been getting bombed while taking Mr. Darcy for his afternoon walk. 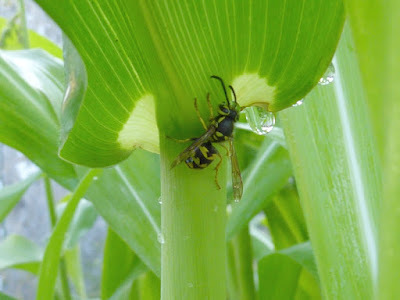 I can't water the garden except in the very early morning otherwise I'm too harassed by the wasps or hornets. Early one morning I was out in the garden, idly watching the cows who were grazing outside the fence where we have some extra tractor tires stacked and waiting to use as garden beds. Suddenly one of the cows snorted, shook her head, swished her tail with agitation, and moved away from one of the tires. A closer inspection revealed a massive paper-wasp nest within. We're talking massive. Oh great. And this is just one of several known nests. Some are small, and some are underground, but they all contribute to the sense of walking on eggshells whenever we set foot outdoors. 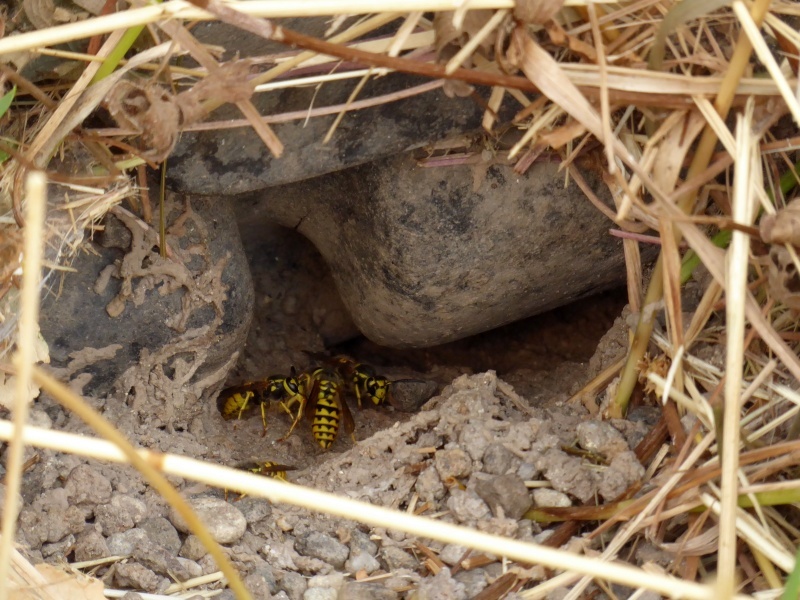 We've set endless traps and caught thousands of wasps, but it barely makes a dent in the population. I'm most bitter about my watermelons, which were developing absolutely beautifully until the wasps discovered them. Now every single melon is being systematically hollowed out by seething masses of wasps. The other day Don had some tractor work to do, clearing brush from a spot, which he did early in the morning to minimize wasp activity. 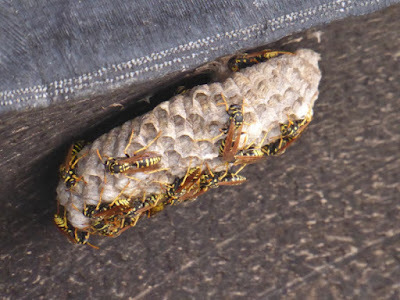 He had to spray out a wasp nest that had formed inside one of the tractor implements. Then -- I'm not kidding -- he donned a full bee suit with zippered veil to work on the tractor. 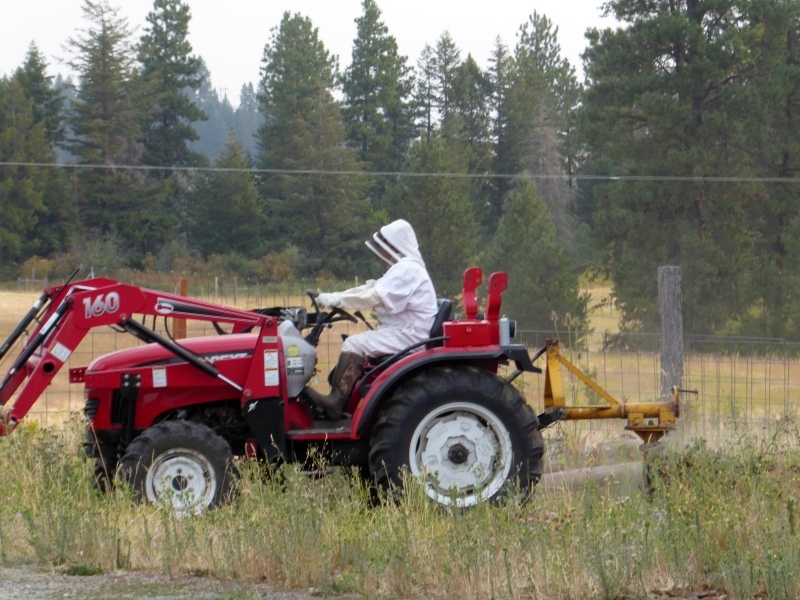 If he'd uncovered a nest while working on the tractor, he would have been severely stung without the bee suit. 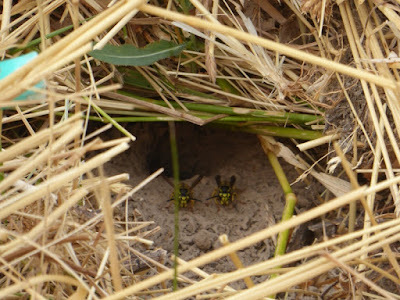 As it turns out he did NOT uncover a nest, but as we joked later, if he HADN'T been wearing the bee suit, he'd have found five. So it's that kind of summer. 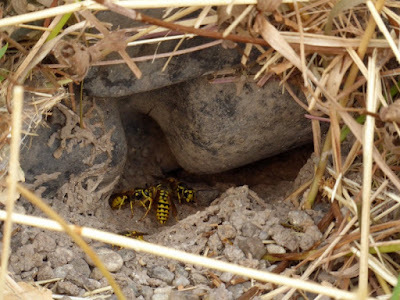 Miraculously, though we've been bitten several times by irascible insects, we haven't been stung (at least, not since Don got one nasty sting back in June while on the tractor). Knock on wood that track record continues. We need a good hard freeze or three to kill all these nasties off. However since that would also kill off the garden just as it's maturing, I guess we'll have to be patient and keep dodging.